Foster parents are the most important ingredient in helping a child heal from the negative effects of abuse and neglect. Children coming into care need the warmth and stability a foster family can provide. This support also provides the birth family a chance to make the necessary changes for the child to return safely home. Children coming into care often need additional services to overcome their emotional, behavioral, medical, or developmental issues. Ariel Clinical Services provides an array of services to foster families and children in care including behavioral consultations, home visits, case management, 24-hour crisis interventions, financial assistance, and respite care. We believe in supporting our foster parents every step of the way as they are caring for these children. We are proud to have over one hundred committed, caring, and nurturing foster parents working with us to provide excellent care to the most vulnerable youth in our communities. Ariel has been one of the most consistently supportive, caring and flexible entities I have ever worked with. Someone there has a knack for hiring good people. Everyone we have ever come into contact with at Ariel has been a pleasure to work with. Foster care is extremely difficult and Ariel makes it bearable and enjoyable. The case managers we have had have never refused us anything, unless they’re schedule didn’t allow it. The fact that you are transporting our foster child every week, attending meetings, etc. has meant a lot to me. I would not have lasted this long in foster care without Ariel. 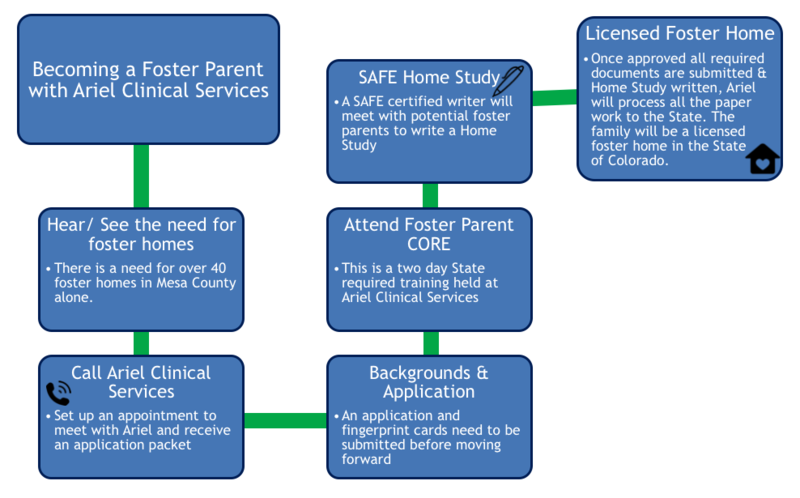 Ariel Clinical Services is also partnering with Denver Human Services on a therapeutic foster care pilot program for the city and county of Denver. Together, with the help of other treatment facilities, the foster care coalition hopes to unite foster parents with training and support to heal children suffering from trauma. Specifically, the coalition is recruiting professionals who have acquired specialized training throughout their careers including, social workers, nurses, counselors, and teachers. These individuals are ideal for providing a stable home for young people who are ready to transition to an in-home placement. A bed for a child. Three to four months from completed application submission to time of first placement. Application must be completed, signed and turned into the office closest to your community. We offer the required CORE training often to ensure timely licensing. Background checks take 10-12 weeks to get back from the FBI. The home study includes 3 to 5 home visits and takes approximately 40 hours to complete. Do I have any say as to who is placed with me? Yes. When Ariel Clinical Services receives information for a new child needing foster care, we start by calling all our foster parents with space in their home for a child. Foster parents are invited to ask any questions they have about the child and the arrangement before agreeing open their home to the child, however sometimes limited information is known in emergency placements. Placements are always a joint decision and we respect that time, circumstances or children may not work or be a fit. If you are interested in becoming a foster parent, please contact the office closest to where you live and we will help you start the process and sign up the next offered training. Yes, however to leave the state with a foster child you must have written approval from the County Case worker. Your Ariel case manager will help you get the proper documents needed and can help make arrangements with another foster family if your foster child is not able to travel with you. You receive a monthly stipend to help supplement the costs of having a child. Each foster home receives the support of a case manager who is in touch with the family weekly or bi-weekly. Additionally, Ariel offers around the clock support. If an issue requiring attention arises with the child, the family can call Ariel at any hour and someone will answer who will be able to help. Support for summer camps and after school programs. We facilitate a monthly foster parent support group that includes training for foster families and child care.